ThirtyFifty has been running wine tasting courses in London since 2004 and hosts a regular diary of events at the superbly located Brasserie Blanc on the Southbank, just 5 minutes walk from Waterloo station. There are plenty of Evening Wine Tastings that you can attend mid-week as well as our best-selling One Day Wine Courses on Saturdays. Whichever session you choose, you'll benefit from our educational yet fun approach and a wine tasting that is great value for money too. The tasting sessions can be booked directly with us online by selecting your preferred date or for gifts we have Open Dated Gift Vouchers which can be redeemed at a later date, valid for 24 months. For upcoming events, please see the dates listed below. Your London Wine Tasting Experiences can be booked directly with us online by clicking on a specified date (below) or, you can purchase an open-dated gift voucher so that a date can be booked after your gift has been received. We'll automatically email you a link to the gift voucher as soon as you complete your purchase, or we have printed gift vouchers that we can post to you for £2 per transaction. Our London team is also available to host wine tastings for private groups and corporate wine tasting events at various venues throughout London. Join us for a brilliant day out in London, tasting 16 wines and a delicious 3 course lunch. All our One Day Wine Courses are run on Saturdays starting at 10.30am and finishing at 4pm. Numbers are restricted to a maximum of 18 so there is plenty of opportunity to get to know other attendees and ask questions. We run two types of days, both are perfectly pitched at both novice wine drinkers as well as seasoned wine enthusiasts with a bit more knowledge, so that everyone will enjoy and get plenty out of the day. For more information about the two different days click on One Day Wine Courses. To book a date, select the date you'd like to attend below to add to your basket. Our evening London wine tasting courses are both refreshing and fun, and a good chance to get a solid grounding that will help you navigate the world of wine with confidence. Tastings can be attended as a one off tasting or as part of a series of evenings to build knowledge. To accompany the wines, there is a charcuterie & cheese platter to tuck into! 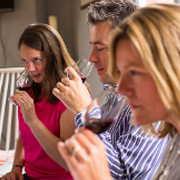 For more information on our different tastings click on Evening Wine Tasting Courses.